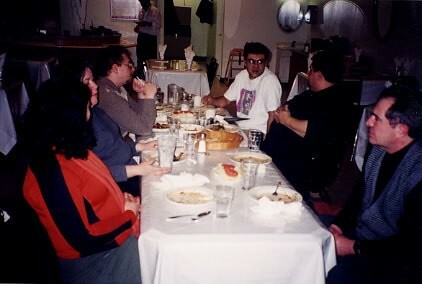 The 2004 Chowhound Westernathon, some long-gone Indian restaurant where the last diehards assembled after 14 hours. How ancient is this history? We were taking food pictures on actual film, that’s how ancient. no, that’s not how it happened. It was crazier and more haphazard than that. Let’s go back. To Chowhound. Chowhound c. 2002 was where a bunch of us, though we weren’t an “us” yet, first started talking about food and, more importantly, meeting about it with strangers. We would meet for lunch, at Spoon or La Quebrada or Kang Nam or “Little” Three Happiness or Los Mogotes or Vito & Nick’s or whatever the enthusiasm of the moment was, and order the weird things with no concern— as we would have had with normal people— that something might gross somebody out. I learned so much and experienced so much in such an intense short time. But more than that, I came to feel that the city was mine at last. A decade after moving here, I no longer felt like a Kansan temporarily working here but that I belonged to the city, I understood the city, it wasn’t something too big and alien to ever comprehend. You want to know where to get great tacos? Here. I read a post about it. I made a movie about Maxwell Street. I’m the guy that knows Chicago. But Chowhound was an imperfect vessel for our aspirations. The management didn’t like us planning events on the board, they didn’t like us seeming like a clique (even though we tried to be as welcoming as possible). I didn’t think they were necessarily wrong by their lights— we were taking something public and impartial and making it our clubhouse, even if we’d welcome anyone into it. But at the same time, I didn’t feel obligated to spend the rest of my days answering the same questions from tourists over and over, either, as remains Chowhound’s primary purpose. We outgrew it, plain and simple. Me and the late Will Philpot, for whom the Will Special sandwich at Riviera was named, at TAC Quick, 2004. No idea who the mom and kid are, or who took this picture with my camera. For a while we planned events on an email list, open to whoever wanted to be on it, but that was cumbersome, too; and there was an incident when Jim Leff (“Big Dog” of Chowhound) read some minor bitching about Chowhound on it and came unglued about its real purpose being ragging on him. It was time to declare independence from New York, and twelve of us became the core group behind it. I suggested that we launch our own discussion board and researched open source software we could use; Gary Wiviott got his hosting company, a bunch of Turkish guys, to install PhpBB (the fact that they also installed a Turkish character set would prove to be a problem years later), Seth Zurer put up the first logo which led me to design one that would be more distinctive (and easier to do on things like T-shirts), and through April and May of 2004 we slowly fiddled around with it, debating board organization, getting our feet wet with a few practice posts (here’s mine, a thread that was still active as of last August). We were getting closer to going public when Rob Gardner mentioned it to somebody (Monica Eng, probably) in the press. Suddenly we were public before we meant to be. Hastily, we had to tell the email list what we were up to— and within about 24 hours, we suddenly had a board that had 125 or so members. In retrospect not at all a bad thing, to be off to a running start; and a very good thing to instantly not just be one homogenous group of friends but a large group with many varied interests, who from the start engaged in multiple conversations and revealed new sides of themselves that Chowhound’s more limited focus had not made room for. Road trip to Milwaukee: Jake’s Deli, 2004. It had its few years, and life moved on (remarkably, this blog has been around almost twice as long as I helped manage the many unique personalities of LTHForum in their interactions; only one of those seems like an eternity). A version of LTHForum exists, and some people still use that in that generous, open-spirited way and discuss things in detail that nobody else is talking about, and bless them for it, while others use it in, well, ways that end in screaming in Thai restaurants. Which is pretty much 180 from the spirit in which it was founded, I’ll just say that. But some friendships from those early days have lasted the decade and more; and in any case it’s a very good thing that the comrades of those days have spread out across the world and infiltrated all kinds of things from media to local organizations and farmer’s markets. 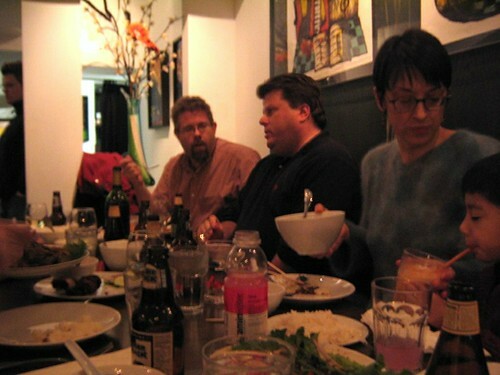 For me the legacy of that time is everywhere that LTHers have spread the gospel that Thai and Mexican food matter, that great food is all over the city, that there’s so much that’s interesting out there to taste and do and it all should be talked about in many different ways and places. It’s Cathy at Culinary Historians, and Hammond at the Sun-Times, and Melissa Graham with Purple Asparagus and Rob Gardner with The Local Beet and Seth Zurer with Baconfest and on and on. It’s the next generation of food writers— apparently 10 years is long enough for a next generation— for whom Burt’s and Lao Sze Chuan and Cemitas Puebla and the Will Special (whoever Will was) and mother-in-laws and 30s style burgers (wherever that description comes from) are just part of the fabric of the city, places we all go and things we all eat, naturally, impossible to imagine a time when people didn’t. We all reap the benefits of that intensive, creative, crazily obsessed time, and take what we gained then with us to whatever we do now. That, it turns out, was the only part of LTHForum that anybody ever truly owned. So I look back in fondness on this tenth anniversary, and thank all who were present at the creation or close enough, we happy few, we band of brothers (of both sexes). Let’s go grab a bite sometime. 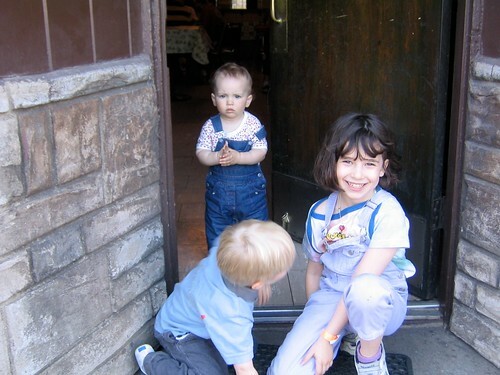 LTH kids in the doorway of Podhalanka, 2004. The wheelchair guy was definitely an interesting part of the evening. Many fond memories of those early years. One of the most successful and memorable finds ended up failing was Tacos del Pacifico. What great food. I don’t think there has been a place like that since in Chicago. I wish I had paid a little more attention on how the the tacos were prepared so I could recreate them. I will say that on that first May evening when we all met I don’t think that we foresaw the world wide reach that LTH has developed. Hi, Bruce, great to hear from you. Hope things are well. Yes, Tacos del Pacifico was wonderful, and I’ve never seen anything like it since. I think the construction was simple, just sealed kind of like an empanada, but how they kept them together was the secret. But they were great. That would have deserved a mention, it was quite an ongoing saga of posts by people who visited the southeast side of Chicago for the first time to eat them.